Microsofts Surface brand is synonymous with premium mobile PCs. The Surface Pro is the template all other PC tablets follow, the Surface Studio is the envy of other all-in-ones, and even the Surface Laptop has pushed PC builders towards more cohesive design and unusual materials. Now, Microsoft is bring that same attention to the office with the Surface Hub 2S. This is only the first step in Microsofts master plan, and its true goal is coming into focus. Surface is not just a premium brand built to influence Windows device design. Its a tool to build the companys vision of tomorrows workplace. Let me get this out of the way; you are not going to buy the Surface Hub 2S. At $9,000, this is an extremely expensive device designed and priced with business use in mind. You dont need this at home  but youre going to want it in your office. The size of the Surface Hub 2S was the first thing I noticed. 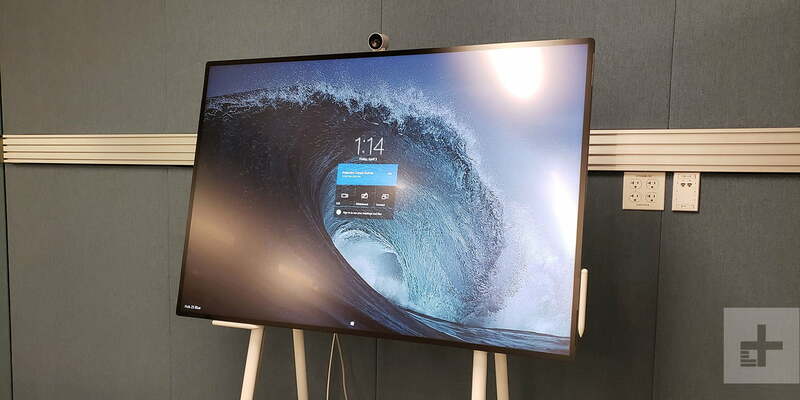 Its much smaller than the original Surface Hub, which came in 84-inch or 55-inch versions. Weight has been trimmed by 40 percent, down to 61 pounds, and the screen size is now just 50 inches (one size fits all). 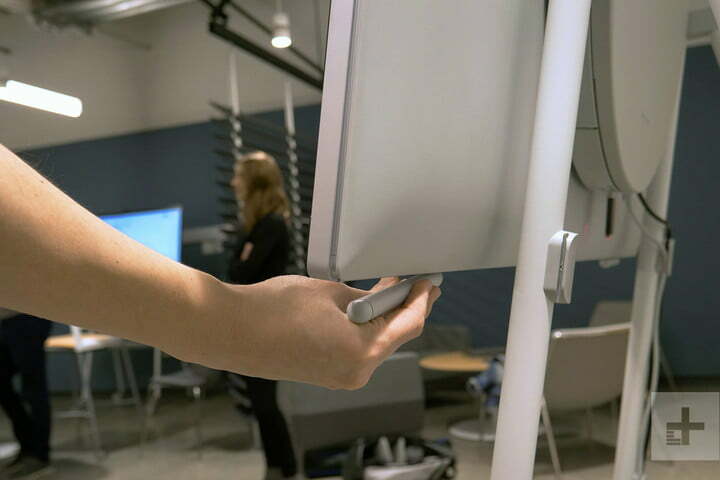 Though it can be wall-mounted, the downsized Hub 2S is meant to sit on a mobile easel built by Steelcase, called The Roam, which reinforces the perception that its a smaller, nimbler device. This meets a key goal for Microsoft: collaboration. A larger version will still exist for companies that want the wow-factor, but Microsoft kept details about it closely guarded, and I didnt have the chance to go hands-on with it. she said. I can whiteboard, while I also pull in live video from a remote location on Teams, while you can project from your phone a file that you have that we dont, put that all on the digital canvas, and participate. It was possible to collaborate on the previous Hub, of course. But because of its size (and the way its mounted flat on a wall, like a television), there were drawbacks. It encouraged a more traditional, presentational style of use, with one person using the Hub at a time. It could also be mistaken for a simple television, and that seemed to inform how people interacted with it. Yes, it was an interactive collaboration tool, but it didnt look like one. I instantly wanted to grab it, tug it around the room, draw on it. The new Hub 2S is a more tactile device, and I felt that from the moment I stepped into a room with it. Reducing the size of the screen makes it more intimate, while placing it on an easel invites interaction. I instantly wanted to grab it, tug it around the room, draw on it  to the dismay of Solar and the rest of the Microsoft team, who hadnt quite finished their presentation. The easel has wheels on it and, as mentioned, the Hub 2S is much lighter than its predecessor. Its a seemingly simple change that required a lot of hard work. Heres the trick. 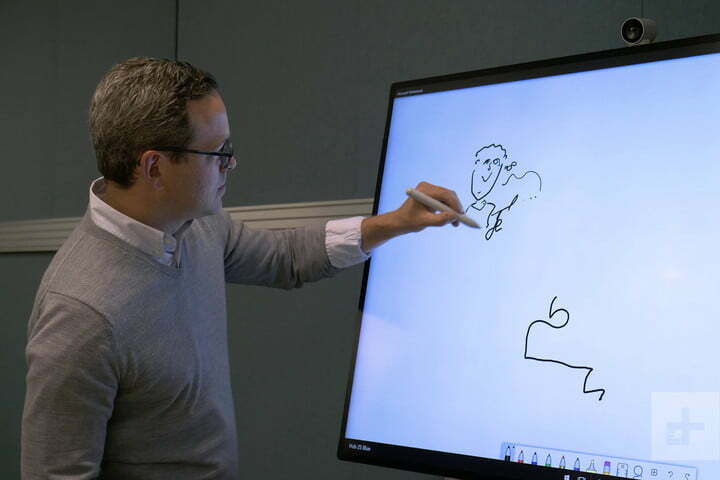 The Hub 2S can move, but it can also be used as a digital whiteboard. The wheels offer just enough resistance to stay in place as you use it but not so much that moving it becomes a chore. I didnt notice the Hub 2S move while I poked and prodded the screen, yet it glided with ease when I wanted to haul it to a new location. The easel is great, but its not the new Hubs secret weapon. Thats the battery cleverly hidden in the easels fabric-covered shelf. Its good for up to two hours of life, Microsoft says, and can charge back to full in 90 minutes. Adding the battery means you can shuttle the Hub 2S around however youd like, and that ties back to collaboration. Unlike a wall-mounted display, this device can be moved and positioned wherever is most comfortable for the group. And if you need to take the Hub 2S out of a conference room  perhaps because a meeting is going into overtime  it can come with you. While the Surface Hub 2S is smaller than its predecessor, there is something thats bigger. 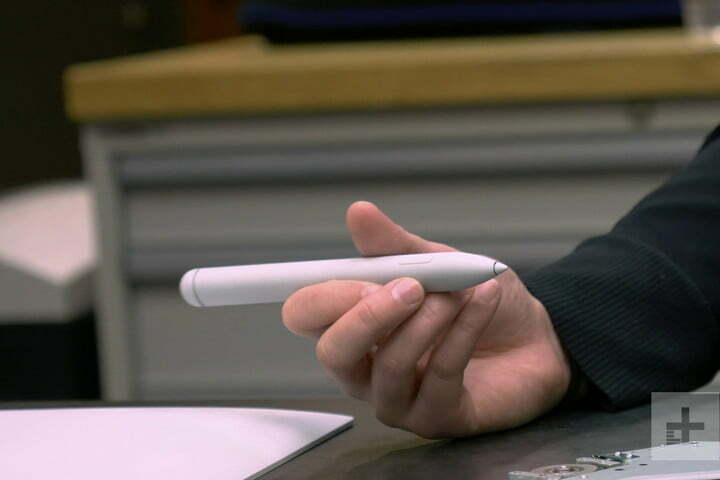 The pen  or, more precisely, the Surface Hub 2 Pen. Its been redesigned with a simple, chunky look that mimics a whiteboard marker. It makes perfect sense for the Hub 2S not only because its easy to grab and start using, but also because its easy to see. The smaller pen on the original Hub was easy to miss, but the Hub 2 Pen is always in sight. Like the Surface Pro and Book, the Hub 2S includes magnetic points that can be used to attach the stylus when its not in use. They dont cover every inch of the bezels, but they come close. Battery life shouldnt be much concern, either, because the Hub 2 Pen offers between 12 and 24 months of life from the AAA battery powering it. Microsoft says the Surface Hub 2 Pen isnt backwards compatible, but it will be compatible with other Surface devices going forward. Youll also be able to use recent iterations of the Surface Pen with the Hub 2S, though Microsoft wasnt yet ready to reveal which will be compatible. The Surface Hub 2 Pen has a simple, chunky look that mimics a whiteboard marker. Once you grab the Pen, you can immediately start using it to draw on the Hub 2S. It runs a slimmed-down version of Windows 10 thats focused on specific apps, like Whiteboard and Microsoft Teams apps, though it can also install software from the Microsoft Store. Solar and other Surface reps declined to label this version of Windows (wed previously heard it referred to as Core OS), but its slimmer than even the ill-fated Windows 10 S. Its designed with a handful of collaborative apps, including those used by Microsoft Teams, in mind. Whatever its called, you dont need to log in to start using it  but if you do need access to your files, thats available. The device automatically times out and wipes its local storage after use to ensure privacy, while your work is saved to the cloud. Integration with Microsoft Teams, and the companys other cloud services, offers some advantages. You can send a file from your smartphone to the Hub 2S without having to bring a laptop or run back to your desk. You can also import photos of a real, physical whiteboard taken on a smartphone, and then convert them into a virtual whiteboard in the Whiteboard app. 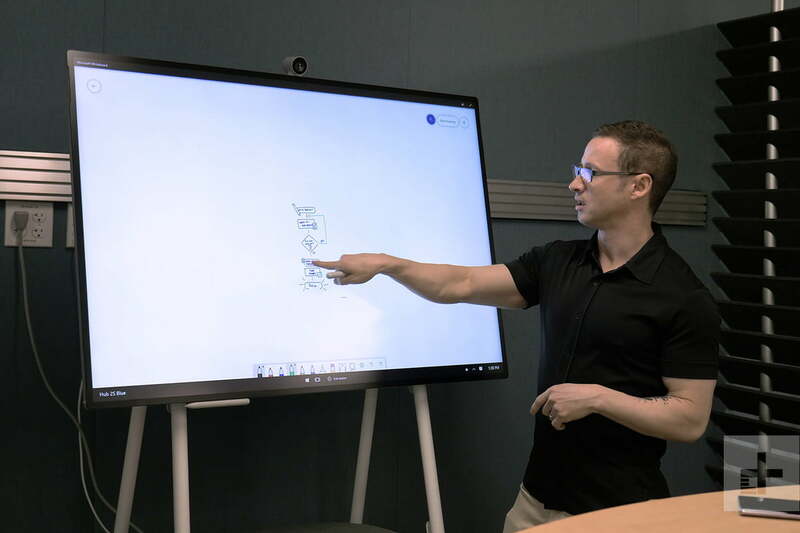 This feature, called InkGrab, bridges the gap in offices that pair a Hub 2S fleet with old-school whiteboards. While the Hub 2S will only ship with its slimmed-down take on Windows, it can actually run Windows 10. Instructions will be available for owners who want to upgrade to Windows 10 Pro. Microsoft thinks theyll be the exception to the rule. Still, its possible that artists and designers will want a Hub 2S to use not as a collaboration tool, but as a plus-sized take on the Surface Studio. I can understand why an artist would want it. The 50-inch 4K+ Pixelsense display is, like the screens on earlier Surface devices, a real stunner. It has a 3:2 aspect ratio with 3,840 x 2,560 resolution and looks crystal-clear. Microsofts displays have consistently scored well in our past reviews, and while I didnt get a chance to do any measured testing, I expect the Hub 2S will deliver strong scores in color accuracy and contrast. Sharpness is its strongest trait. Fine fonts looked perfect even when I stood just a couple feet from the device. Thin, modern bezels surround the display. They measure just 15 millimeters thick, which I found a bit surprising. Large touchscreens sometimes stick to large bezels, arguing that users need a place to grab the device, and past Surface devices (including the Pro) were chunkier than some peers. Keeping the bezels slim helps the Surface Hub 2S stand out as modern, refined, and elegant. Parallax is kept to a minimum by bonding the display glass directly to the touchscreen. This technique is critical to the Pen experience because it reduces the gap between the tip of the pen and the touchscreen itself. Scribbling on the Hub 2S truly feels like drawing on a real whiteboard. Audio hasnt been ignored. The Hub 2S includes an 8-element beam-forming microphone array for high-quality conference audio. Thin speakers are tucked into the bezels  theyre virtually invisible  but deliver strong sound thanks to a bass module thats tucked away around back. A modular 4K camera rounds out the experience. It can be attached to three sides of the screen, thanks to ports located on each flank. Its also designed to break away if disturbed. That might seem strange, but its meant to protect both the port and the display. The Hub 2S is mobile, remember, so it must tolerate unintended encounters with doorways and walls. Judging the Surface Hub 2S is tricky. At $9,000, its not exactly affordable, and its not built with home users in mind. Yes, it runs Windows  but its more business tool, less personal computer. As a tool, though, its promising, and it may well change your life even if you never own it. My time with the Surface Hub 2S left me thinking Microsoft is on to something. Companies of all sizes love to talk about collaboration, but the talk is usually just that. The Hub 2S is different. It questions all the usual assumptions about what sitting in a room with your co-workers should look like, and the result is a device thats far more approachable and intuitive than any smart display Ive laid hands on. If anything will give interested businesses hesitation, its the Hub 2X, the follow-on model simultaneously revealed by Microsoft. The Hub 2X has everything found on the Hub 2S, but with an extra trick. It rotates. Strangely, the Hub 2S ships with the rotation mechanism physically in place, but its disabled. Microsoft will let owners upgrade the Hub 2S to the Hub 2X when the latter releases by purchasing a new compute module that slides in the back and unlocks rotation. This is an odd way to roll out the Hub 2S though, perhaps, not that relevant. Its easy to fixate on the rotating screen. But having used the Hub 2S, I think it could be a niche feature that looks cool but wont often be needed. The real story is Microsofts decision to transform the Hub from an impersonal, TV-like, wall-mounted slate into a tactile piece of hardware that invites you to touch it  and move it. Its a pleasantly analog take on a digital device, and one that has a chance of achieving its lofty goal of changing the way you work. Microsoft will release the Surface Hub 2S and Steelcase Roam in July at $8,999.99 (for North America). Europe, the Middle East, Africa, and Asia Pacific will see it in July. 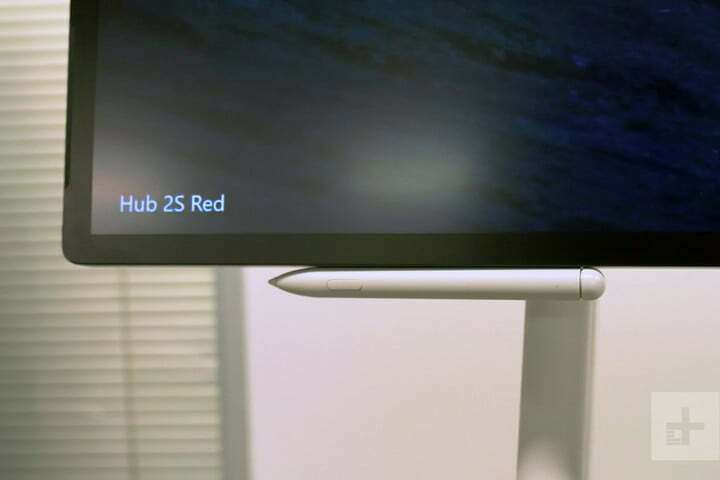 The Hub 2S includes one Surface Hub 2 Pen and one Surface Hub 2 Camera. The Steelcase Roam easel and the APC battery pack will be sold separately. Published on Wed, 17 Apr 2019 15:00:39 GMT, © All rights reserved by the publisher.